Former Indonesian president’s foundation served as conduit for push to overturn U.S. ban on military cooperation. By Andreas Harsono in Jakarta and Nathaniel Heller in Washington D.C. 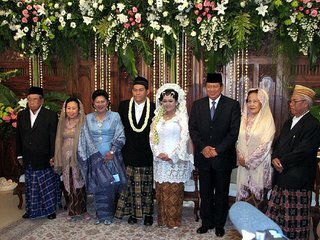 THE INDONESIAN national intelligence agency used a former Indonesian president’s charitable foundation to hire a Washington lobbying firm in 2005 to press the U.S. Congress for a full resumption of controversial military training programs to the country, the Center for Public Integrity’s International Consortium of Investigative Journalists has learned. BIN has a long history of involvement in human rights abuses and was recently linked to the assassination of a prominent Indonesian human rights activist. The Gus Dur Foundation was established by former Indonesian President Abdurrahman Wahid, who goes by the nickname of Gus Dur and is known for his moderate politics and support for human rights . Gus Dur and another foundation official denied knowing about the contract between their Jakarta-based charity group and the lobbying firm. In late 2005 Congress and the State Department fully reinstated military cooperation and aid to Indonesia. The documents were uncovered as part of a year-long ICIJ investigation into changes in America’s post-Sept. 11 foreign military aid and assistance programs and the impact of those changes on human rights. The investigation is focusing on 10 key countries, including Indonesia, and is scheduled for release in early 2007. In May 2005, the Gus Dur Foundation retained Collins & Co. for $30,000 a month to lobby Congress and the Bush administration to “remove legislative and policy restrictions on security cooperation with Indonesia,” according to a copy of a signed contract. On July 31, 2005, the contract between Collins & Co. and the Gus Dur Foundation was terminated and, effective Sept. 1, a new contract for the same monthly amount was executed directly between Collins & Co. and BIN, the FARA documents show. Records indicate that the second contract ended in November 2005. Collins & Co. lobbyists did not return repeated calls requesting comment. The original contract defines Collins & Co.’s mission in the context of Indonesia’s “obstacles to a more cooperative relationship with the United States, particularly in the area of military cooperation … the image of Indonesia, especially in the United States Congress, remains highly negative and colored by events in East Timor and other disturbed areas like Papua and Aceh… .” Those obstacles were indeed substantial. In response to Indonesian troops opening fire and killing more than 100 demonstrators in East Timor on Nov. 12, 1991, Congress banned Indonesia from receiving funding and training under the International Military Education and Training (IMET) program, which is overseen by the State Department and implemented by the Defense Department to provide military education training to foreign military and civilian officials. Even under the IMET ban, U.S. Special Operations forces continued to carry out training with their Indonesian counterparts through the Department of Defense’s Joint Combined Exchanged Training Program. But after a violent crackdown on anti-government demonstrators in May 1998, the joint training program was severed. President Bill Clinton finally banned the exports of all defense materials and services to Indonesia after Indonesian troops and related militia groups launched attacks in East Timor following the United Nations-administered independence referendum in 1999. In the U.S. Foreign Operations Appropriations Bill for fiscal 2000, Congress stipulated that neither IMET nor the Foreign Military Financing (FMF) program – which provides U.S. taxpayer financing for foreign militaries’ purchases of U.S. military goods, services and training – would be permitted for Indonesia unless there was a legitimate reform of the Indonesian army as well as prosecution of the major human rights offenders. The FARA filings also reflect the fact that part of Collins & Co.'s charge was to assuage congressional concerns over the assassination of Indonesian human rights campaigner Munir Thalib, whose killing has been linked in Indonesian court proceedings to BIN. According to Central Jakarta district court documents, Munir was poisoned with arsenic that was sprayed on his fried noodles during a Garuda Indonesia flight from Jakarta to Amsterdam on Sept. 7, 2004. The court sentenced a Garuda pilot, Pollycarpus Budihari Priyanto, to 14 years imprisonment for poisoning Munir and for carrying forged travel documents. The court documents describe a sophisticated killing that suggested the involvement of a larger, well-organized group of perpetrators. It also noted that Pollycarpus had no personal motive to kill Munir. The court recommended that the Indonesian police investigate Garuda Indonesia’s security officials. The court proceedings also brought to light 41 telephone conversations that took place between Pollycarpus and a mobile phone number, 0811-900978, before and after Munir’s assassination. The mobile phone’s owner was Maj. Gen. Muchdi Purwopranjono, a deputy director at BIN. Muchdi was formerly the commander of the Indonesian army’s Special Forces Koppasus unit, which was involved in kidnapping student activists during the Suharto era. He was removed from his position just days after Suharto’s resignation in 1998 and retired from the military the next year. An investigative commission found that a Koppasus unit was involved in assassinating Papua leader Theys Eluai in November 2001. In his court testimony, Muchdi Purwopranjono confirmed that 0811-900978 was his mobile phone number, but he said it was frequently used by his driver and aides. He denied having ever met Pollycarpus. He also denied ordering Munir’s assassination. In Washington, Collins & Co. did its best to convince Congress that the Indonesian military and security apparatus had overcome its checkered history and was ready once again for normal treatment under the IMET and FMF programs. BIN’s choice of Collins & Co. was no coincidence: Collins & Co.’s vice president for international business, Eric Newsom, was a former assistant secretary of state for political-military affairs in charge of running the IMET and FMF programs. He was also a former top aide to Democratic Sen. Patrick Leahy (Vt.), a key figure in the Senate on human rights issues and U.S.-Indonesia policy. The FARA records show that between June and October of 2005, Collins & Co. lobbyists, sometimes accompanied by BIN officials, met with several key members of Congress and their staffs. Among them were Leahy and Sens. Chuck Hagel, R-Neb., and Lisa Murkowski, R-Alaska, as well Rep. Jesse Jackson Jr. and an aide to Sen. Barack Obama, both Democrats of Illinois. Newsom accompanied BIN deputy head As’ad Said Ali and BIN deputy director Burhan Mohammed to a meeting with Leahy and a key aide just off the Senate floor on July 21, 2005. According to Tim Reiser, Leahy’s top aide on the Senate Appropriations Committee’s subcommittee for State, Foreign Operations, and Related Programs (whose annual funding bill finances the IMET and FMF programs), Leahy agreed to take the 15-minute meeting to express his opposition to the resumption of full military cooperation with Indonesia. Leahy told As’ad that he didn’t think real reform had taken place within the Indonesian military. The Collins & Co. lobbying was certainly not the only reason that military cooperation was eventually reinstated; in fact, some of the key policy changes took place before Collins & Co. signed the initial contract with the Gus Dur Foundation. The push for reinstating IMET and FMF for Indonesia began shortly after the Bush administration took office in 2001. The administration and Republican allies in Congress say the previous policy of punishing Indonesia for human rights violations had not paid dividends ; the much-hoped-for reform of the Indonesian military and security apparatus had not taken place. In a post-Sept. 11 environment when Indonesia suddenly took on greater strategic importance for the U.S., both the State and Defense departments sought to reinstate IMET and FMF as a demonstration of Washington’s gratitude for Indonesian assistance in the global war on terrorism. In February 2005, Secretary of State Condoleeza Rice determined that the Indonesian military had reformed itself sufficiently to merit the resumption of IMET; later in November, the restrictions on FMF and defense exports were lifted. Gus Dur is an internationally known Muslim cleric. He formerly headed the Nahdatul Ulama, Indonesia’s largest Muslim organization and is widely recognized as an advocate of moderate Islam. He helped lead the opposition against Suharto in the 1990s, and in 1999, he became the first elected Indonesian president of the post-Suharto dictatorship. Gus Dur was forced out of office by the Indonesian parliament in July 2001 over his erratic governing style and ceded power to Megawati Sukarnoputri. Megawati was succeeded by the current president, Susilo Bambang Yudhoyono, who was elected in 2004. But he added that he has close relations with Syamsir Siregar, the head of BIN, and As’ad Said Ali, BIN’s second-in-command. According to Abdullah, the foundation was established in January 2005, two weeks after the Asian tsunami hit the Indonesia island of Aceh. He described the foundation’s objectives as establishing orphanages, public libraries and schools and holding scientific seminars. The foundation “has nothing to do with the military or international lobbying. We never had a meeting in which we talked about BIN,” Abdullah told ICIJ. The foundation’s governing documents show that Gus Dur is its founder. He appointed Abdullah and three other men to sit on its board: Aris Junaidi, the treasurer, and members Salim Muhamad and Sulaiman. “They’re all close associates to Gus Dur. They’re mostly political adventurers,” said Ahmad Suaedy, executive director of the Wahid Institute, whose office is located at Jl. Taman Amir Hamzah 8 in Jakarta – the same address noted in the Collins & Co. contract as that of the Gus Dur Foundation. Muhyiddin Arubusman, a close associate of Gus Dur, signed the original Collins & Co. contract on behalf of the Gus Dur Foundation. Arubusman is a member of the Indonesian parliament from the Nation Awakening Party, whose patron is also Gus Dur. Ikhsan Abdullah, the Gus Dur Foundation secretary, told ICIJ that Arubusman had no official position at the foundation, although Arubusman – as well as BIN deputy head As-ad Said Ali – frequently attended foundation meetings between January and May 2005 to talk about fundraising. As-ad is a member of the Nahdlatul Ulama. Arubusman comes from Ende, a small town on Flores Island, which is a predominantly Catholic area. The Ende airport is named for his father’s uncle Hasan Aroeboesman. Earlier this year, Muhyiddin Arubusman edited and published a book on terrorism, Terorisme di Tengah Arus Global Demokrasi (“Terrorism in the Global Democratic Current”), in which both BIN’s As-ad Said Ali and Gus Dur wrote chapters. The Free Acheh Movement declared independence in December 1976, arguing that the Acehnese were being colonized by Indonesia. The movement claims that "Indonesia" is a name foisted on minority ethnic groups by the "Javanese," the main ethnic group in Indonesia from its most populous island. The Free Papua Organization began in 1965 when the Dutch, who formerly ruled the Indonesian islands as colonies, were still supporting Papua’s push to be an independent state. Indonesia invaded Papua and manipulated a U.N. independence referendum there in 1969. Proponents of a unified Indonesia argued that the country should comprise all of the former Dutch colonies, including Papua. Arubusman gave a mixed answer when asked whether he was authorized to sign the contract on behalf of the Gus Dur Foundation or whether Gus Dur himself knew about the contract. “I can’t discuss more. I have to bear in mind Gus Dur’s good name. He didn’t know,” Arubusman said. Legislator Muhammad A.S. Hikam, whose office is next to Arubusman’s, was dubious that Arubusman has the savvy to understand Washington’s political corridors or to hire a firm such as Collins & Co. “He even doesn’t speak English very well,” Hikam said. When Arubusman signed that first contract with Collins & Co. in May 2005, President Yudhoyono’s fact-finding team on the Munir killing was about to recommend that the police investigate BIN’s involvement in the assassination. Yudhoyono also ordered Lt. Gen. Syamsir Siregar, who had taken over the job of heading BIN from Lt. Gen. A.M. Hendroprijono, to open up his institution to public scrutiny. But BIN dragged its feet and continues to refuse to cooperate with the police investigation, citing its need to protect state secrets. BIN did not respond when contacted several times to comment on this story. Ikhsan Abdullah, the Gus Dur Foundation’s secretary, wondered aloud how Munir’s friends and widow would respond if they knew that the Gus Dur Foundation was involved in lobbying the U.S. Congress to resume full military cooperation with Indonesia. Susanna Hamblin and Marina Walker Guevara contributed to this report. The ICIJ investigation is supported by funding from the JEHT Foundation. Gus Dur is the patron of PAN? Are you sure of this? it is indeed an interesting document although i can't quite see how it links Munir's murder to Gus Dur, the contract expired within two months and was resumed directly with BIN, as far as i know Gus Dur's pretty close to Munir - personally - just as he was pretty close to many of those in BIN as well, no? Thank you for the correction. I wrote the "National Awakening Party" or "Pantau Kebangkitan Bangsa" but it should be better translated as the "Nation Awakening Party." I think Gus Dur knew more than what he told me. Aris Junaidi said that the idea was discussed in the GDF discussions. in any case, even when it's probably a little peculiar, i'm not sure how it implies a (direct) connection to Munir, it was a widely accepted policy of the gov't/military at the time to try resuming relation with the US, right? i'm just wondering how the lobbying story gets tangled up with the murder cover up. GD has contacts and definitely has many agendas, but i really doubt that he'd have anything to do with that. what do you think? BIN is still linked to the Munir assasination. I'm not surprised if anyone working with BIN is asked about the assasination. The longer the BIN drags its feet on the Munir investigation, which is very likely, the more damage that it has done on its reputation. When Gus Dur got connected to the BIN, it is also not surprising that their link is also used by the BIN to help answer its link to the assasination. Arubusman told me he didn't know that the contract was linked to Munir. being an ex president, isn't it very normal that he will be somewhat connected to BIN? especially in matter such as lobbying. He's also very close to Hendropriyono. i'm not at all siding, i'm just curious since the article implies his links to the murder, i wonder if there's any backgrounder that didn't make it to the article to establish this connection. good web blog, please write more and more untold story in indonesian news paper. Yayasan Gus Dur dan BIN Melobi AS?